Arms. Ermine, on a saltire, gules, a leopard's face. The Bodkins of Galway, and the Earls of Desmond and Kildare, were descended from the common ancestor, Maurice Fitzgerald, Lord of Windsor. Maurice was one of the first invaders of Ireland, under Strongbow. His son, Thomas FitzMaurice, acquired ample possessions in Munster, where his descendants became Earls of Desmond. Richard, the son of Thomas, about the year 1242, held considerable properties in Connaught, under Richard de Burgo. Thomas, his son, was the ancestor of the Bodkin family. This family name originated from a victory gained by their great progenitor, Thomas Fitz Richard (about the year 1300,) over a valiant Irish knight, whom he encountered in single combat. Having made use of a short spear, in Irish called, a Baudekin, he was, from that circumstance, surnamed, Buaidh Baudekin, of the victory of the Bodkin, which name was afterwards retained by his descendants. Whatever doubt may attend this traditionary relation, none can exist as to the origin and descent of the family. 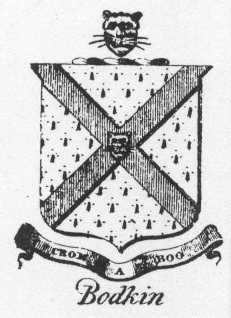 They are fully ascertained by the testimony of antiquaries, by ancient stone sculptures and monuments, still remaining, and from the genealogies of the Geraldines, whose arms the Bodkin family bore for many generations, and whose motto, Crom aboo, they retain to this day. Henry Bodkin, the son of Thomas, was Clericus ville in the reign of Richard II. at which time, there was a street or lane in Galway, called Baudekyn's Lane. They owned large properties in and about the town, particularly at Newcastle area, near the river; and at Athenry, Toherskehine, Ballynameathagh, Kilcornan and Parke. At present the principal families of the name, are those of Annagh, Carrowbeg, Castletown, Kilcloony and Thomastown. The Bodkin genealogies give us some important clues in tracing the Athy lineage. The origins of the Athy's and the old Bodkin genealogy indicates that Francis Athy of Galway had a daughter, Susannah Athy, who married Patrick Bodkin.